James E. Magner – in Tucson, AZ formerly of Woburn, MA, March 25th. Beloved husband of L. Lorraine Magner of Tucson, AZ. Beloved father of James Magner, his wife Linda of Largo, FL, David Magner, his wife Letitia McCune of Tucson, AZ, Karen Magner, her husband Mark Sarni, of Redondo Beach, CA and Lynda Booth, her husband Richard of Tucson, AZ. Dear brother of William Magner of Peabody and Kathleen Kelly of Needham. Cherished grandfather of James Magner of Tucson, AZ, Karma Sarni from Redondo Beach, CA and Veronica Haakonsen from Somerville, MA. Relatives and friends are invited to call Friday, April 5th from 4-8 p.m. at the Lynch-Cantillon Funeral Home 263 Main St., Woburn, MA. His funeral service will take place on Saturday at 10 a.m. in the funeral home with burial to follow in Calvary Cemetery, Winchester. In lieu of flowers, remembrances may be made in his memory to the Alzheimer’s Association http://act.alz.org/site/TR and then searching by his name, James Magner or mail to 225 N. Michigan Ave., floor 17, Chicago, IL 60601. James E. Magner – in Tucson, AZ formerly of Woburn, MA, died peacefully, March 25th, with his family by his side. He was the beloved husband of 58 years to L. Lorraine Magner of Tucson, AZ. Born in Boston, MA, Jim was a son of the late David and Mary (Hennelly) Magner. He was educated at St Clement’s and a graduate of Northeastern University. For many years, Jim worked at Raytheon. Jim enjoyed golfing and was a member of the Woburn Country Club. He also was a long time member of the Woburn Elks. 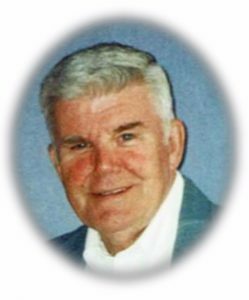 He founded the Woburn Academic Association and was very involved in Woburn Little League. Along with his wife Lorraine, James is survived and will be deeply missed by his children, James Magner, his wife Linda of Largo, FL, David Magner, his wife Letitia McCune of Tucson, AZ, Karen Magner, her husband Mark Sarni, of Redondo Beach, CA and Lynda Booth, her husband Richard of Tucson, AZ. Dear brother of William Magner of Peabody and Kathleen Kelly of Needham. Cherished grandfather of James Magner of Tucson, AZ, Karma Sarni from Redondo Beach, CA and Veronica Haakonsen from Somerville, MA. Relatives and friends are invited to call Friday, April 5th from 4-8 p.m. at the Lynch-Cantillon Funeral Home 263 Main St., Woburn, MA. His funeral service will take place on Saturday at 10 a.m. in the funeral home with burial to follow in Calvary Cemetery, Winchester. In lieu of flowers, remembrances may be made in his memory to the Alzheimer’s Association http://act.alz.org/site/TR and then searching by his name, James Magner or mail to 225 N. Michigan Ave., floor 17, Chicago, IL 60601. Relatives and friends are invited to call Friday, April 5th from 4-8 p.m. at the Lynch-Cantillon Funeral Home 263 Main St., Woburn, MA. His funeral service will take place on Saturday at 10 a.m. in the funeral home with burial to follow in Calvary Cemetery, Winchester. In lieu of flowers, remembrances may be made in his memory to the Alzheimer’s Association http://act.alz.org/site/TR and then searching by his name, James Magner or mail to 225 N. Michigan Ave., Fl, 17, Chicago, IL 60601. Dear Lorraine and family. I am very sorry for loss of your husband and father. I will keep you in my prayers. You folks are in our thoughts and have all our sympathy. St. Clement’s was a very long time ago, but I do remember Jim as one of the good guys. Through June I have followed the adventures of you, Jim and the offspring over these many years, and witnessed a long and happy, fruitful marriage–a wonderful rarity in today’s world. Deeply sorry it had to end. May you continue to be surrounded by the love of family and friends in these coming years. My thoughts are with you. May you find strength in the love that surrounds you . May you find peace in the memories you cherish. Our thoughts and prayers are with you despite the distance. Loads of love, Your cousins Denyse and Laurette. Peace to you, Lorraine and family. We’ll hold Jim in our hearts forever. My deepest condolences to the entire Magner family. I knew and worked for Jim for many years. Jim was an awesome person. I had great respect and admiration for him. So sorry for your loss. As far back as I can remember, I have nothing but fun, crazy, warm and loving memories of this wonderful man whom I was privileged to have as my Godfather, as well as Uncle. He left a lasting legacy and will missed by all! My heart goes out to you dear cousins and especially you, Auntie Lorraine. I am so sorry for your loss. He was such an important part of my family’s life, and we will cherish that time we spent with him and with you. Love you Uncle Jim and will miss you. I will never forget Jim’s Smile… it was contagious. He was a good friend and coworker. So sorry for your loss. RIP Jim!